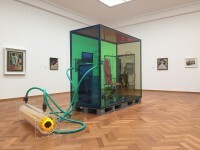 A large perspex isolation cell, wherein Folkert de Jong placed readymade objects. 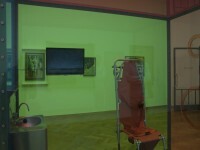 A toilet of stainless steel from a prison cell and a bright orange surgical stretcher chair create a strange (and estranging) setting together. While the surrounding acrylic glass generates distance, time markers and cries, carved from the inside, reveal someone’s previous confinement. Here the eccentric, grotesque character of De Jong’s earlier work has been replaced by a clinical feeling of oppression. How long did time stand still in here? Via a long tube, the cell connects with an adjacent chemical test display, where energy seems to bubble. As in a time machine, there is an alluring, hopeful opening for escape—a potential teleportation. Folkert de Jong asked me to make a video piece in which the state of mind of the prisoner is unfolding. This work is on permanent display at the Gemeente Museum in The Hague and added to the museum collection.